According to Super Bright LEDs, its LED step lights can be used for a number of indoor and outdoor applications. Super Bright LEDs, an online retailer for LED lights, introduced two all-weather step lights to its line of LED landscape and deck lights product line. According to the company, the lights are ideal for deck steps but have a number of indoor and outdoor applications, including stairways, hallways and pathways. The LED step lights feature frosted glass lenses, and all-weather constructed polycarbonate housing seals their internal components. 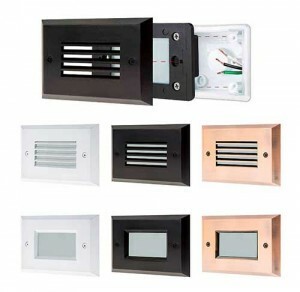 The lights are available in low-voltage 12V AC/DC or high-voltage 100-240V AC options, as well as flat faceplate or louvered faceplate options. In addition, they are available in white, aged brushed copper and oil-rubbed bronze finishes.